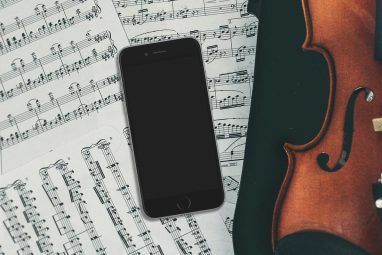 The best way to learn music is probably to learn how to play a real instrument, but if you’re like me and you don’t have the time, Apple’s popular song-producing application, GarageBand, can be useful for both the musically and non-musically inclined to have fun with music. I’m of the latter group – I know little of nothing about producing music. But when I find the time, I sometimes open GarageBand and play around with it enough to produce a few software instrument jams for the mere fun of it. If you have a copy of Apple’s iLife ’09 or later installed on your Mac, it contains GarageBand and includes a feature called Magic GarageBand. If you hardly know anything about music and have never used GarageBand before, Magic GarageBand is a good place to start. It consists of a collection of song templates that allow you to creatively choose instrument styles to build upon a selected theme song. You can also play an instrument or sing along using a microphone plugged into your Mac. But the goal of the article is to introduce you to Magic Garageband and how it works. You can play around with it to your heart’s content and learn about instruments and melodies along the way. You can also download Garageband ($5) to your iPad or other supporting iOS devices. Tim reviewed that app here 5 Reasons to Spend $5 on GarageBand for iOS [iPad, iPhone, and iPod Touch] 5 Reasons to Spend $5 on GarageBand for iOS [iPad, iPhone, and iPod Touch] Apple’s popular home music production suite GarageBand has been iOS-friendly on the iPad for a while now, and thanks to last month’s update iPhone and iPod Touch users can finally jam along too. This article... Read More . When you launch GarageBand, it presents you with a variety of projects you can build songs from, but we’re going to focus on Magic Garageband. Select it on the left panel. You will see nine genres of music – Blues, Rock, Jazz, Country, Reggae, Funk, Latin, and Rock, and Slow Blues. While there’s a variety of music genres, it doesn’t contain a variety of styles of themed songs for each type of music. But there’s still enough to get you started and have some fun. So choose any genre you like, by double-clicking on it, or selecting it, and then click the Choose button on the bottom-right. 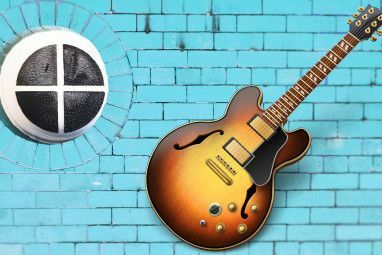 Give GarageBand a few seconds to load instruments, and you will be presented with a “Stage” of your selected project. The project includes the theme music for that genre, a timeline consisting of the song’s structure, the different instruments playing the song. For example, with the Funk genre, it consists of an Intro, Verse, Bridge, a second Verse, and the Ending. The project also consists of various software instruments you can select and add on top of the themed song. This is where your creativity comes in. For instruments, there’s even a wider selection of types of instruments. Click on, for example, the drum instrument in the stage area, and you will get a variety of drums to sample and add to your project. 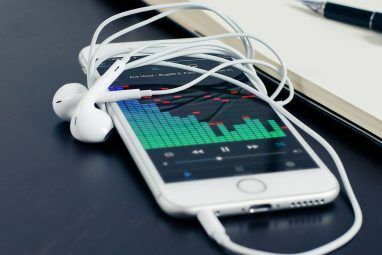 You can of course jump in anywhere and just play around with the project, but here are a few suggestions for getting started if this is your first time using Magic Garageband. You might start off by playing the theme song a couple of times from beginning to end. Put the playhead in at the beginning of the timeline, and then click the black triangle button. Also make sure “Entire Song” is selected. You will hear the basic song structure and the existing instruments on stage. Get a feel for the song’s tempo and how it changes. Now to get a sense of how different instruments and styles of instruments impact a song, select an instrument on the stage; it should become highlighted with a spotlight. Upon selection, a black box will pop-up with the instrument’s name, which indicates you can control what role the instrument plays in the song. The Audio icon in the box turns that instrument on and off. The Headphone icon isolates and plays only that instrument so you can hear specifically how it sounds. And then of course there is a volume control for that instrument. To focus on the role of an instrument, I suggest first selecting just one section and listening for how that instrument plays in the song. Select a section of the timeline, and then click Snippet, which means that the selected section will be played over and over until you click Stop. Now play the snippet, and while the section is playing, click the Headphone icon of a selected instrument and play it so you can hear how it sounds in the song. Also mute the instrument and see how it sounds when it’s not playing in the section. The beauty of Magic Garageband is that you can sample as many styles of instruments as you like. As you play the section, sample the other instruments and styles and let your creative juices flow. Don’t feel as though you need all the instruments playing in the song. Mute a few and see if it results in a more interesting arrangement. Try the same approach with the other sections, and just play around. If you want to get back to the original setup, just click on the Stage area, and Start Over. When you’re ready, you can open the Magic Garageband song into GarageBand, which opens a whole other level of song arrangement and production. Now you have all the software loops available to you to further play around with, mute, or even create solos. There’s no limit to what you can do with GarageBand, you just need the time, and the willingness to experiment. Who knows, it may lead you to take the advanced steps of learning an instrument or doing actual song writing. Let us know what you think of Magic Garageband. Do you find it easy to use? Do you have suggestions for better ways of using it? Hey Chris, thanks for catching that. My editor has updated it. Yep, Mac Witty, I figured most people haven't cracked opened GB in a while. I'm thinking about writing a few more articles about using this software. It seems like a good way to learn song writing and a musical instrument. Thanks for your feedback. Hey Kyem, thanks for feedback. I've heard of Logic Pro. I guess once you get a handle on GB, Logic Pro is the next step up. .
Hey Jack, well, you're right, the title could include "Music," but the program is actually called "Magic GarageBand." You can add almost any software instrument to a themed song and it will seem to fit. Thanks for the feedback.